Moulton Avery is an expert on heat and cold stress. He gave his first public lecture on hypothermia in 1974. He was executive director of the Center for Environmental Physiology in Washington, DC for ten years, and is the founder and director of the National Center for Cold Water Safety. He is a former ACA Sea Kayaking Instructor and Instructor Trainer. A little over 20 years ago, Sea Kayaker magazine editor Chris Cunningham stuck his neck out and published my article Cold Shock (Spring 1991). Cold water safety was a controversial subject at the time, and with one notable exception, every single letter to the editor written in response to the article was negative. Among other things, I was accused of scaring paddlers, misrepresenting the facts, and making cold water paddling sound a whole lot more dangerous than it really was. Eric wasn’t quite world-famous at the time, but he was a force to be reckoned with in the fledgling sea kayaking community, and when he wrote that the article should be “taped to the forehead of every sea kayaker”, people took notice. I don’t have enough words or space to describe how much his letter meant to me personally. What I can say is that his firm, unwavering support came at a critical moment, and was invaluable in advancing the cause of cold water safety in our sport. Fast forward 20 years to the middle of May 2010. It’s a gorgeous and unseasonably warm spring day on the coast of Maine, but the water temperature is still a bone-chilling 48F (9C). Irina McEntee, 18, and her best friend Carissa Ireland, 20, decide to go paddling. They are the same age as my own two daughters. Wearing nothing more than shorts and light shirts, the pair launch their 12-foot blue-green recreational boats in calm water at 13.30 and begin what they think will be a short, two-mile round trip from Peaks Island to Ram Island in Casco Bay. Irina’s parents actually have a view of the route from their home, and see both girls complete the crossing and land safely on the island. Irina had been kayaking for a number of years, and she’d paddled this route without incident many times before. Carissa, however, had no previous kayaking experience. Other than the PFDs they were wearing, neither girl carried any safety or communications gear. Ram Island is only a mile across the water from Peaks, but the location is exposed – to the east, south, and south east, there’s nothing but open ocean, and neither Irina’s parents nor the girls were aware that the National Weather Service had issued a Small Craft Advisory for that afternoon. By the time Irina and Carissa launched their boats for the return trip, the weather had worsened considerably. The tide was ebbing and the wind had picked up, blowing out of the north and gusting to 22mph. Unable to make headway in those conditions, they were at the mercy of both wind and tide, which blew them south and carried them east, away from land and into progressively rougher water. on schedule, Irina’s parents looked out the window and saw much rougher conditions with no kayaks in sight. By then it was 2.5 hours before sunset. They called the Coast Guard, which promptly dispatched the 207-foot US Coast Guard cutter Campbell, launched a Jayhawk helicopter and Falcon jet from Air Station Cape Cod, sent out an emergency broadcast on Channel 16, and contacted their ‘local partners’, setting in motion what was to become a massive search operation. As any pilot can attest, it’s not easy to spot small objects from the air. Nevertheless, by 20:30 pm both kayaks had been located, floating in the open ocean roughly seven miles South of Ram Island, and about a mile SSE of Cape Elizabeth. One kayak was upright and contained a jacket and T-shirt; the other was upside-down. Irina and Carissa were nowhere in sight. After a grueling all-night search involving multiple local agencies and more than 150 people, the girls were found by the Coast Guard at 09:00 the following morning, floating lifeless in their PFDs, about a mile apart and two miles from where their boats had been found the night before. I’ve never had an easy time reading about these incidents, and because my daughters were so close in age to the two girls, this one picked me up and shook me like a rag doll. I knew rationally that their deaths weren’t my fault, but emotionally, as a father, I couldn’t shake the haunting feeling that maybe if I’d done more to promote cold water safety rather than quitting the field at half-time to raise two daughters of my own, Irina and Carissa might still be alive. I wrestled with that feeling for weeks before finally deciding that I couldn’t live with myself if I walked away from this unspeakable tragedy and went on with my life as if nothing had happened. He was right, of course. Good people have indeed come out of the woodwork, and they continue to do so. The center is incorporated, we’re a whisker away from obtaining our 501(c)(3) non-profit status from the Internal Revenue Service, and our website is live. Eric, I truly wish you were here to see it. At the core of the National Center for Cold Water Safety are five ‘Golden Rules’. Each rule is there for good, realistic, practical reasons that we’re going to explain in detail in future issues. Take a peek at the box on the right. You can find Eric in every single one of them. A lot of people and organizations pay it lip service, while at the same time jumping through hoops and going to great lengths to argue that it doesn’t apply to them because they are the exception to the rule. In some circles, people are actively discouraged from wearing ‘extreme’ clothing like wetsuits or drysuits – unless, of course, they plan on encountering ‘challenging conditions’ or anticipate ‘being slammed in the face by a cold wave’. If that’s the case, then by all means, suit up. But if they aren’t planning on having any of that rough stuff happen – if they have no intention of capsizing – well, in that case, it’s just fine to skip the protection. This sort of nonsense can be found in videos, books, magazines, and instruction manuals. It’s also quite prevalent on the web. The problem with all these excuses is that although they work just fine in Fantasyland, they’re exactly the kind of magical thinking that can get you killed in the real world. Nobody ever plans on capsizing. Nor do they ever plan on encountering conditions ‘challenging’ enough to kill them. The bottom line for anyone paddling on cold water is whether or not he or she are adequately prepared for immersion, and the only way to be prepared for immersion is to dress for the water temperature. No Exceptions! What’s your own experience with cold water? What’s your take on the Golden Rules of Cold Water Safety? Are you always prepared for immersion when you paddle on cold water? If not, what’s your excuse? Please comment and let your mates know what you think. Always dress for the water temperature – no exceptions! I’m not going to capsize. The water temperature is above 60F. I brought extra clothing and warm drinks. I paddle ‘close to shore’ or in ‘protected waters’. I don’t plan on encountering ‘challenging conditions’. They’re uncomfortable and get in the way of my paddling. I paddle with a group and can quickly get back in my boat. Air temperature plus the water temperature equals whatever, so it’s safe. The air temperature is too warm and I’m worried that I’ll overheat. I’m just going out for a quick paddle, not an expedition to the North Pole. They’re too expensive, I’m on a tight budget, and I don’t kayak that often. In Southeast Alaska we have what’s called the 50/50 rule. You have 50 percent chance of survival at 50 yards from shore (if swimming to shore). If you do make it to shore but do not have survival gear or a way to make a fire, shelter, communication your chances of survival are slim due to hypothermia. When paddling around glaciers and icebergs the 50/50 rule is lower. 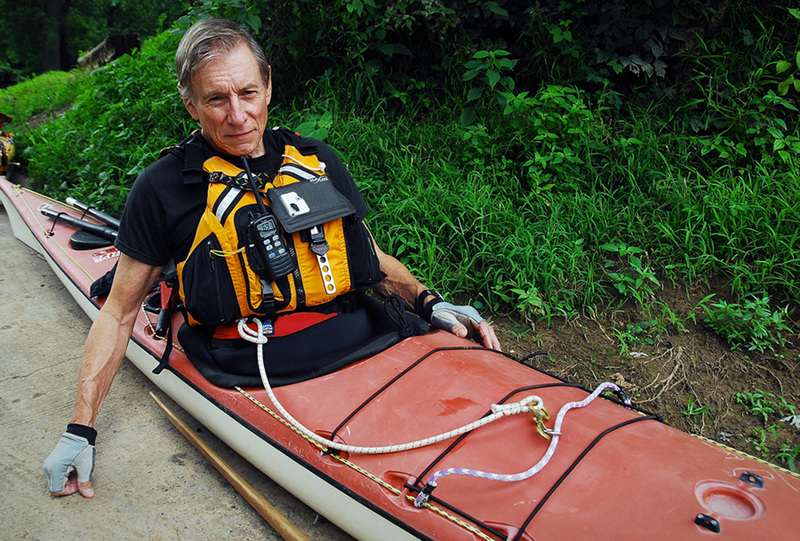 Most experience paddlers carry a small ditch bag on their PFD with basic survival gear. It’s very important to know personal rescue skills. The rule of thumb here also is if you see 10 percent whitecaps and building there is no reason to be on the water. I fully admit to being stupid at times, but my excuse is the river in my yard is no more than three feet deep. If I fall off surfski or kayak, just stand up get in and paddle home until warm!